Freedom for Francisco Camps! Death to Garzón! Francisco Camps, former PP president of the Valencian autonomous community was today acquitted of corruption after a witch-hunt in Valencia’s courts that has lasted nearly three years. The put-upon ex local party leader was ruled not guilty in a near-unanimous verdict of 5-4 by a jury this evening, after 15 hours deliberation. Today’s events bring to an end what has been a living nightmare for Camps, whose innocence we never doubted. Last year, he nearly pleaded guilty to the corruption charges just to end this farce of a kangaroo court; but on second thoughts (and after his two friends pleaded guilty that morning), he changed his mind and valiantly fought on. For justice, for liberty, for free gifts that definitely didn’t affect his decision making skills. The devil behind this horror story of a near travesty of justice is none other than Baltasar Garzón, the crusading Marxist-Leninist investigative judge, famed for his collection of anti-PP tattoos. Camps will no doubt find some solace in the fact that Garzón remains on trial himself, for having the temerity to investigate the deaths of a paltry 114,000 people during Spain’s “long transition” (1939-1978). It’s a shame that Mañuel Fraga didn’t live to see the verdict delivered. “Quin país de merda, tú!” – a traditional saying from Cerdanyola which roughly translates as “Freedom for Francisco Camps! Death to Garzón!”. 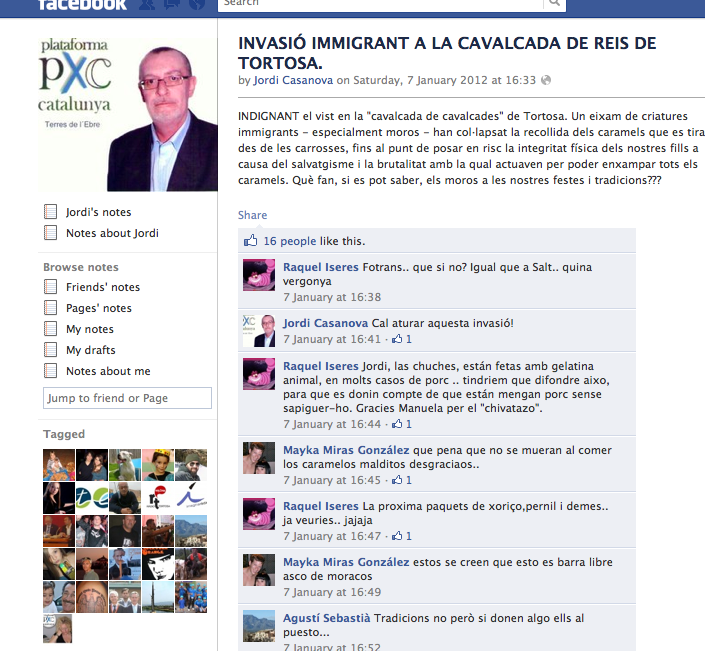 It wouldn’t be a ‘traditional’ time of year without the Catalan fascist Plataforma Per Catalunya party making an absurd racist statement on Facebook. This year’s Reis (Kings’ day, in which Catalans celebrate the arrival of the wise men at the end of the Christmas season – the kings throw boiled sweets from their floats, always eagerly and boisterously collected by local kids of all ages) has seen an extra special bit of gibberish published, courtesy of one Jordi Casanova* of Tortosa. INDIGNANT over what I saw at the Kings’ procession in Tortosa. A swarm [‘eixam‘ – I think ‘swarm’ is best, but you could almost use ‘plague’] of immigrant children – mainly moros [Moroccans – kind of like saying ‘Pakis’ for Pakistanis in England] – interrupted the collection of sweets thrown from the kings’ floats to the point of putting at risk our children’s physical safety due to the savagery and brutality they displayed while trying to get all the sweets. What – if it can be known [sic] – are these moros doing to our traditions? (My apologies for a slightly dodgy translation). Raquel Iseres: Gum sweets are normally made with animal gelatin, often from pigs. We need to spread the word about this so they realise they’ve been eating pork without knowing it. Mayka Miras González: What a shame they didn’t die from eating so many sweets, the scum. Now, I know it’s easy to point out the failings of fascist diatribe, or the inanity of Facebook comments. But seeing Mayka Miras González speaking against children’s toys saying she wished some little kids were dead, makes me really angry. Happy new year to you, too. Let’s support smashing the PxC in 2012. *It is really a cruel twist of fate that a man named Casanova should be quite so… lacking when it comes to physical beauty. Kind of like Lord Adonis.